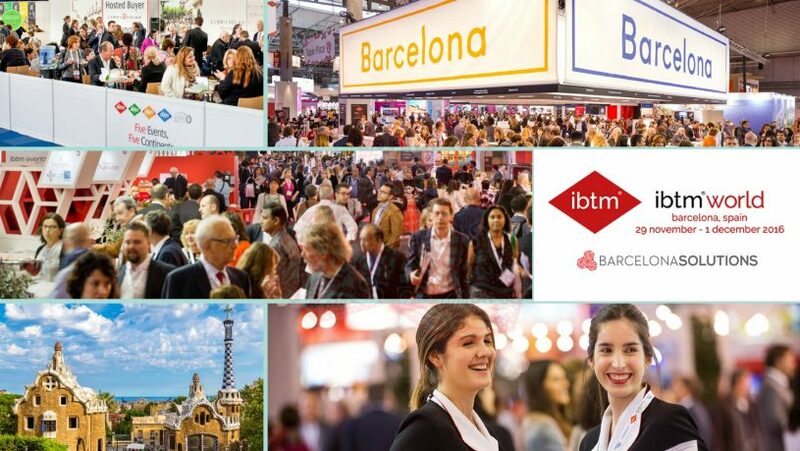 From 29th November to 1st December, Barcelona is once again host to IBTM World. This leading event for the MICE sector draws together hundreds of major clients, providers and leading industry figures. IBTM 2016 promises to be quite a show, with more on offer than ever. In an interconnected world economy, nothing’s more important for a business than networking with suppliers, clients and peers. The Meetings Industry facilitates this process, adding value to the global economy that is measured in billions. In addition, MICE tourism (Meetings, Incentives, Conferences and Events) forms a substantial part of the overall tourist economy. For example, an estimated 30% of visitors to the UK head there for meetings and conferences. The social impact of the Meetings Industry goes beyond even this. By spreading knowledge and expertise, the industry has a significant role in the growth of technology, investment, trade and communications. Events and conferences have benefits for every sector – and the Meetings Industry itself is no exception. IBTM world 2016 is one of the most important global events in the Meeting Industry calendar. With a 28-year history, it’s amongst the longest-established and successful industry events, attracting thousands of sector stakeholders for a fascinating and lucrative three-day congress. Suppliers and clients meet at the event, networking and striking deals on an epic scale. The 2015 event saw 80,000 appointments scheduled before the show even opened – each one representing a potential contract. Visitors to IBTM 2016 are spoiled for choice. Many will have their sights firmly set on making deals and networking. The former is facilitated through the organiser’s innovative Hosted Buyers programme. Hosted Buyers are corporate representatives who attend the conference with a view to forming relationships with industry suppliers. IBTM ensures these individuals have the authority and budget to strike deals. The programme means that suitable suppliers can arrange invaluable face-to-face meetings with potential VIP clients. Apart from Hosted Buyers, much initial contact will take place at the thousands of exhibitors stands. The sectors represented include airlines, cruise lines, attractions, conference and meeting venues, technology providers and travel management companies. To make visitors’ lives easier, the exhibition space is logically organised into geographical zones. The event offers three major opportunities for networking. The Welcome Reception helps attendees make first contacts in a friendly and buzzing atmosphere, with drinks and mouth-watering food supplied. On the next day, a networking hour provides a backdrop of varied entertainment whilst visitors get to know each other more. Finally, the Rendezvous event turns up the fun factor. Set in the Opium Barcelona nightclub, there will be bars, dancing and entertainment to positively encourage mixing business with pleasure. Lastly, the innovation zone allows visitors to experience first-hand where the MICE industry is headed. With hands-on demonstrations, innovation awards, help with technology and mini-sessions with innovation experts, attendees can get ahead of the curve – at least for a while. Barcelona has hosted the IBTM since 2004. It’s easy to see the attraction. It’s charm, vibrancy and well-developed infrastructure make it the perfect city for any conference – and let’s not forget the climate! However, we recommend that you make use of the best local service providers when visiting the IBTM 2016. As in any city, local knowledge will allow you to find great hotels, efficient transport (including airport transfer) and the best deals. Barcelona Solutions have that local knowledge, along with years of experience in corporate travel arrangements. We offer a one-stop solution for attending the conference. We will take care of your accommodation, travel and any other requirements, supporting your team with a single point of contact. And we’ll do all this at a competitive price. Please get in touch with our team to discuss your needs, and we will take care of the rest.